In January 1914, with Europe on the brink of war and the United States in the throes of a depression, Henry Ford announced that he was doubling his workers’ pay from $2.34 per day to a princely $5 and, at the same time, reducing their nine-hour workday to eight hours. Ford Motor Company was, he said, initiating “the greatest revolution in the matter of rewards for its workers ever known to the industrial world.” Strange as it may seem in today’s inflated economy, $5 per day was indeed a handsome wage in 1914, and what Ford did was every bit as revolutionary as he proclaimed. 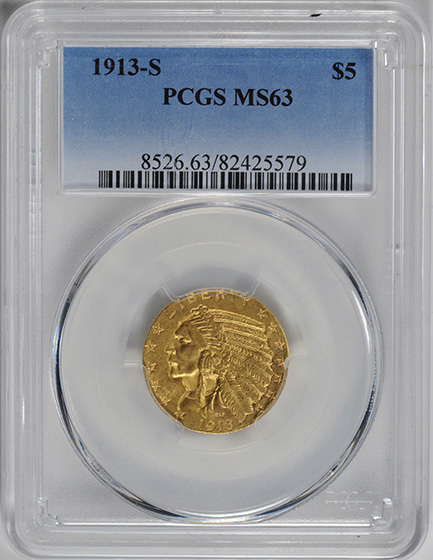 Clearly then, the half eagle—or $5 gold piece—was a coin with considerable clout in 1914, even though it was only slightly larger than the then brand-new “Buffalo” nickel. After all, it represented a full day’s pay for well-paid workers—enough to buy a pair of trousers plus a pair of work boots. 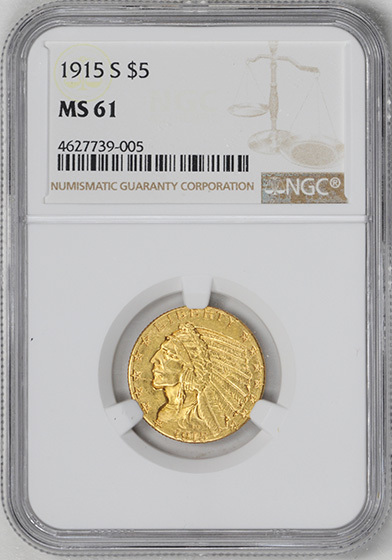 In another respect, however, these Indian Head gold pieces are unlike any other coins produced before or since by Uncle Sam: Their designs and inscriptions are sunken below the surface of the coins, rather than being raised. This innovative technique was quite daring, for no other modern coins had ever used it. In normal times, in fact, the idea might well have been scrapped. But new ideas were welcome in national affairs in the early 1900s, thanks in large measure to one larger-than-life individual: President Theodore Roosevelt. The restless, dynamic Roosevelt took a personal interest in virtually all aspects of the American scene—including the nation’s coinage—and left his personal imprint on many areas. The idea of recessing the coins’ features came from William Sturgis Bigelow, a Boston physician and art lover who happened to be a close friend of Roosevelt’s. Bigelow had seen incuse relief in Egyptian art works at the Boston Museum of Fine Arts, and he piqued the president’s interest with his notion of adapting this technique to U. S. coinage. With Roosevelt’s blessing, he engaged a fellow Bostonian, noted sculptor Bela-Lyon Pratt, to prepare coinage models, and Pratt developed designs pairing an Indian brave on the obverse with an eagle in repose on the reverse. The new coins must have bewildered many Americans when they first entered circulation near the end of 1908. Beyond their unusual relief, they also represented the first fundamental design change in the two denominations in nearly 70 years. Other than the addition of the words IN GOD WE TRUST in 1866, the previous half eagle—which carried a portrait of Liberty with a coronet in her hair—had been basically the same since its origin in 1839. Critics such as Chapman were doomed to disappointment in their bid to derail the new coins, although they had an influential ally in the U. S. Mint’s chief engraver, Charles E. Barber. Jealously defending his turf, Barber did make seemingly unneeded modifications in Pratt’s designs, just as he had done earlier with Saint-Gaudens’ models. But in the final analysis, Roosevelt’s support was all that mattered. Being recessed, the design elements on Indian Head half eagles are shielded from heavy wear. 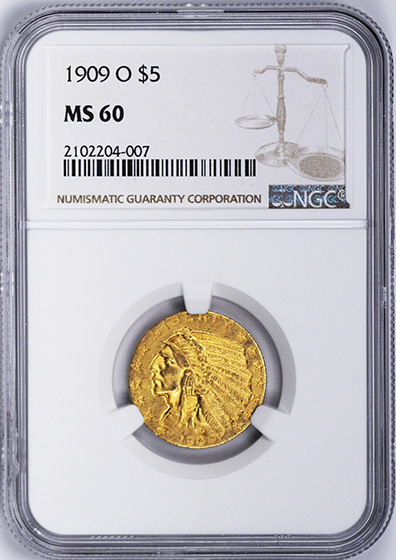 At the same time, this complicates grading since wear patterns differ from those of raised-relief coins. Critical areas for detecting wear are the Indian’s cheekbone and headdress feathers and the shoulder of the eagle’s left wing. 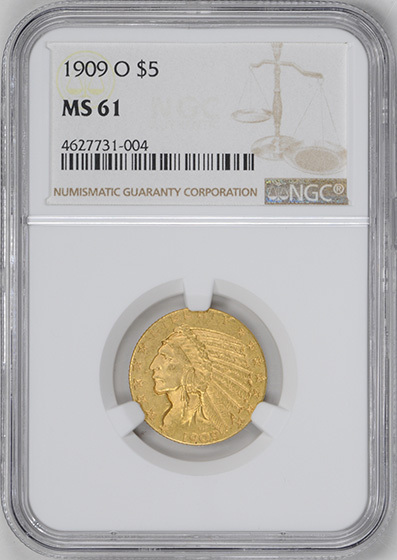 Although these coins are plentiful in grades up to Mint State-64, they are quite elusive in MS-65 and very rare above that level. 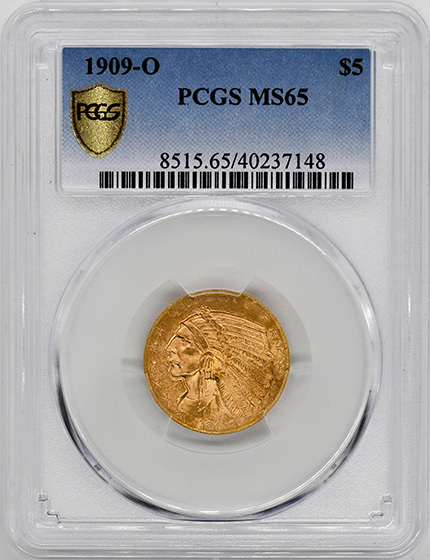 Though its innovative design met with mixed reviews, the Indian Head half eagle was saved in its first year of issue. The Philadelphia Mint pieces of 1908 represent one of the most available dates of this series in mint state. All other issues seem to have survived in this condition by mere chance. Easily the most commonly seen mint state examples of this type are those dated 1909-D. Thousands turned up in a hoard some years ago though, not surprisingly, precious few were gems. While coins of this type were generally well struck, the same did not apply to their mintmarks. As the only elements raised above the level of the field, these tiny letters are often found shallow and indistinct. Only slight wear can render them unreadable. 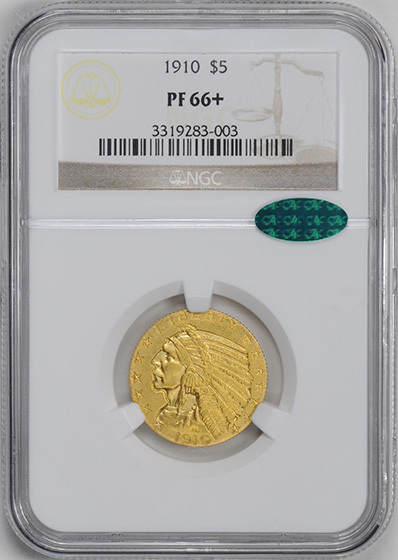 This is especially true of the San Francisco Mint coins, though the 1909-O half eagle is likewise notorious for having a mintmark that’s difficult to distinguish, even on mint state coins. Henry Ford probably wasn’t thinking of the Indian Head half eagle when he instituted the $5 workday, yet the coin’s career did seem to parallel Ford’s: It came into being the same year as the Model T, and it left the Mint’s production line two years after the Model T gave way to the Model A.